RacingPost Forecast option selects one or more runners accordingly to their betting forecast on Racing Post website. A runner is selected if difference in it’s Betfair price and RacingPost forecast price is within specified range. 1. Min difference, Max difference – sets the range where the difference in runner’s Betfair price and forecast price must lie. 2. Difference in % – if ticked the difference range will be set in %, otherwise in absolute price numbers. 3. Difference must be – Positive, Negative, Any. Positive – Betfair price must be above forecast price, e.g. between F/C + 10% and F/C + 100%. Negative – Betfair price must be below forecast price, e.g. between F/C – 10% and F/C – 100%. Any – both positive and negative difference is accepted. 5. Number of runners to select – how many runners with given criteria (ABS difference or high/low price) to select. For example, if this parameter is 3, then three runners with lowest ABS difference will be selected to bet. 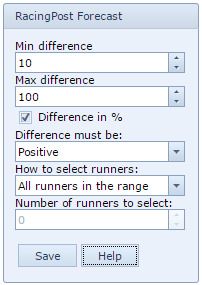 If option #4 is set to select ‘All runners in the range’ the number of runners is ignored and all runners are selected. If number of runners is set at 0, one runner will be selected anyway. If you set number of runners at 3, but only 1 runner matches your min and max difference limits, then only one runner that is matching the criteria is selected. How to select = Highest ABS difference. How to select = All runners in the range. For example, a runner’s Betfair price is 2.30 and it’s Racing Post forecast is 7/4. First of all we should convert fractional odds (7/4) to decimal odds: (7/4) + 1 = 2.75. To find absolute difference we should deduct forecast price from Betfair price: 2.30 – 2.75 = -0.45. Difference in % will be: -0.45 / 2.75 = -16.4%.